Albany, N.Y. – The New York Credit Union Foundation is pleased to announce the winners of the 2013 statewide Desjardins Youth Financial Education Award, which honors credit unions that demonstrate a significant commitment to youth financial education. First-place winners of the 2013 Desjardins Youth Financial Education Award include: Clarence Community & Schools FCU, CORE FCU and Teachers FCU. These credit unions will advance to the National Credit Union Foundation's national competition this fall. Clarence Community & Schools FCU (Clarence) was selected in the asset category of less than $50 million. In 2012, the credit union continued offering a Youth $avings Program in all six Clarence district schools, providing more than 5,000 students with an opportunity to open and maintain a savings account. Credit union staff also delivered financial education presentations in local schools and collaborated with numerous community organizations to promote youth financial literacy. Most recently, Clarence Community & Schools FCU developed and sponsored the National Academy of Finance program, which enables Clarence High School students to intern at the credit union's high school branch and main office. CORE FCU (Syracuse) was selected in the asset category of $50 million-$150 million. The credit union reached more than 1,000 students last year through its student financial literacy program and in-school branch/banking days. Using a "students as educators" model, credit union staff trained high-school students to deliver financial literacy presentations and "Reality Check" events to their peers and younger students. CORE FCU staff also delivered numerous financial literacy presentations themselves, with one staff member providing business classes with personal finance training three days each week. The credit union also continued working with the ESM school district, local parents, educators and community leaders to build awareness about the importance of financial literacy. 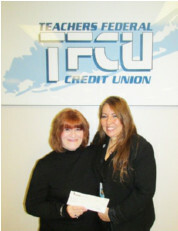 Teachers FCU (Hauppauge) was selected in the asset category of more than $500 million. In 2012, the credit union offered "Bank-at-School" programs within seven Suffolk County school districts, providing students with access to savings accounts and the opportunity to assist as interns. Credit union staff also delivered youth training on key financial skills, from financial workshops like Money & Me to credit-building sessions. Additionally, the credit union sponsored two free National Endowment for Financial Education (NEFE) training sessions for educators in Nassau and Suffolk counties, equipping them with skills to build financial literacy in the classroom. NYCUF also selected Buffalo Metropolitan FCU as a second-place winner in the asset category of 50 million-$150 million. These credit unions will be honored June 15 at the Credit Union Association of New York's Annual Meeting & Convention. (Albany, NY) – Thanks to the generosity of the credit union community, 331 Hurricane Sandy victims and two credit unions have received disaster relief grants to help fund their recovery. Funds were raised and distributed through the National Credit Union Foundation (NCUF) CUAid program and the New York Credit Union Foundation (NYCUF) statewide Disaster Relief Fund. Through the CUAid program, NCUF awarded more than $260,000 in grants to credit union employees, volunteers and members in New York and New Jersey. A total of 94 New York applicants received CUAid grants. NYCUF's statewide Disaster Relief Fund raised and awarded $149,158 to 237 New York credit union employees, volunteers and members from 22 credit unions, and to two credit unions (Oceanside Christopher FCU and Entertainment Industries FCU). "The devastation caused by Hurricane Sandy was significant, but so was the outpouring of support we saw from the credit union community in its aftermath," said William J. Mellin, president/CEO of the Credit Union Association of New York. "Thanks to our national and statewide disaster relief funds, we have been able to step in and help hundreds of families with their recovery." "When the check from the Foundation arrived, some of our members broke down crying in our lobby. All of a sudden, 'People Helping People' was not just a slogan." "The selfless, unconditional generosity offered to our family from complete strangers gives us priceless strength to help us get through this very stressful time." "I'm overwhelmed by the generosity and spirit of caring and helping that motivated the credit union community to reach out and assist we who were affected by the storm. Thank you from the bottom of our hearts." "A heartfelt thank you. Through the kindness of strangers, our family is one step closer to getting home." "I was feeling so overwhelmed all day and came home to your letter and check...I cannot begin to tell you how much this lifted my spirits." "Thank you, thank you, thank you...credit unions are the greatest!"